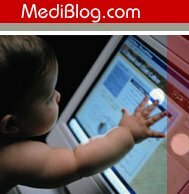 The Story of MediBlog: Oh no - G+ogle! It emerges that Google have been working on an application like MediBlog for a year or so and for some strange reason they've given the project the name "Weaver". This discovery has made us stop to think about whether we really want to persue the MediBlog project with a team of three enthusiasts: why bother if Google can throw 15 sqillion dollars and half of California's Uber-geeks at it? There are a few things we'll probably be doing differently and its possible that these innovations may never even get out of the Visio/Word stage - just because we've found out that Google are working in the same area. Anyway, there are a few screenshots of the Google service around on the net, its interesting to see how Google have approached the problem and also the ensuing blog comments have highlighted a number of other existing services e.g. revolutionhealth.com and openhealthrecord.org which are in various stages on completion. 1. "Don't trust 'em: Google are mad, bad and dangerous to know"
"The test comes when the good times end. At that point shareholders will demand trade-offs in their favour". "Besides the slow risk of calcification that comes with growth, there is also the risk that Nooglers (new Google staff) will dilute Google's un-evil values". They cited the example of Nick Leeson, the misguided criminal who gambled away Barings bank. I suppose that we won't know what Google might do if the good times end, but Google's value also depends a lot on goodwill - if they get caught doing something really,really bad (e.g. somehow compromising private health records) then we could all decide to stop using them and the value of the company will reduce quite rapidly - shareholders will probably understand that and for that reason I doubt there will ever be much pressure for them to "turn evil". The Nick Leeson analogy is more realistic - a small bunch of criminals or fools could do something to release private information but that risk lies with every large (or small!) company. This line of thinking suggests that Google is really a force for good and are the only ones who can really sort out this problem. Someone found a link to it..
My current line of thinking is that there's always room for more than one player in any market so we should still continue to see if our ideas fly - at least until we have to dedicate serious money or time to it when the risks of "competing" head-on with Google will be more understood. In any case, Google haven't finished it yet - it won't be ready to help with the HistioNet project and in my opinion it will never be an appopriate tool for narrowly defined bepoke projects like that.